Android has a lot of image editing apps. However, most of them won’t support layers like Photoshop which makes it not so easy to use when you want to manipulate the photo to meet your needs. So to deal with that, here are some of the best Photoshop alternatives apps for Android that support layers. 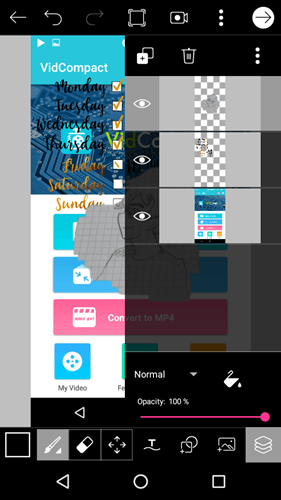 Though many knew Adobe has a mobile application called Photoshop Express that is capable of doing light photo editing, there is no support for layers whatsoever. To deal with that, Adobe released another app called Photoshop Mix that supports layers just like in the desktop version. The app is mainly aimed towards photographers who want to do some quick edits or enhancements before sharing it with others. As such, you can adjust colors, contrast, add or remove filters, enhance entire or a selected area, control opacity, blend, create masks, etc. 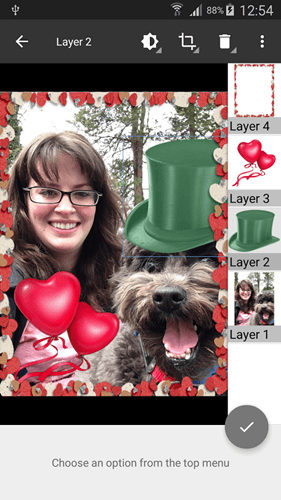 Since the app readily supports layers, you can cut and combine different pictures into one using different layers. What makes Photoshop Mix special is its easy-to-use user interface and layers. Moreover, every option is easily accessible and adding layers is as easy as tapping a single Add icon. That being said, though you can add layers in Photoshop Mix, you are limited to five layers at any given time. Moreover, you need to sign in with your Adobe ID to use the app. If you don’t mind these two limitations, the give Adobe Photoshop Mix a try and see if it fits your needs. After all, it is free. Price: The app is completely free but requires you to sign in with your Adobe ID to use the app. If you don’t have Adobe ID, you can sign up for free right from the app. PicsArt Photo Studio is one of the most popular photo editing software for Android that is filled with features and has a huge community on YouTube. Of course, the app supports layers but being a mobile application it approaches the feature a bit differently from Photoshop Mix. 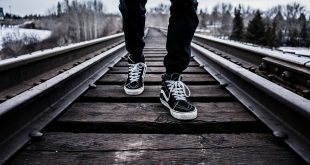 When you editing a photo, you can add additional photos, pictures, or text on to of it and they are automatically treated as individual layers until you save the image. To properly use the layers functionality and get most of it, you need to select the “Draw” option. From there you can create individual layers as needed, turn on and off them, blend, create masks, etc. The good thing is, the app auto-saves your work, there is no limitation on how many layers you can create. In fact, you can individually blend, and transform layers as needed. Other features of the app include but not limited to the ability create stickers, clipart, built-in frames, filters, backgrounds, callouts, ability to create AI-powered Prisma-style effects, and more. If you are looking for photo editor app that supports transparency and layers, give PicsArt a try. Price: The app is free and ad-supported. However, the app does provide in-app purchases for things like premium stickers, clipart, etc. Pixlr is very similar to the previous app PicsArt. That’s is, both apps have tons of features hidden underneath a simple interface and support for layer editing. Though, unlike PicsArt, we didn’t find the support for transparency in Pixlr. 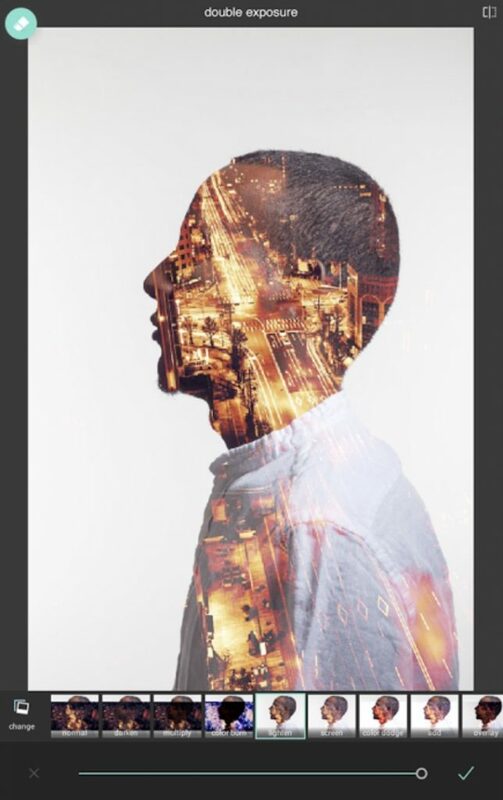 While the app doesn’t support the traditional layers format, instead, you can layer multiple photos and blend them together to get a unique look, using Double Exposure. If you are looking for a full-fledged photo editing app that has a good support for layers then Multi-Layer Photo Editor is for you. As you can tell from the name itself, you can edit your pictures, photos, and other images in multiple layers. The apps user interface is feature rich while still being very simple to use even for beginners. Just like with Photoshop Mix, you can easily add layers with just a single tap. Once added, you can move individual layers to foreground or background by dragging and dropping them, manipulate individual layers with a selection of tools like frames, gradients, transparency, shadows, horizontal or vertical flipping, blend modes, magic wand, background eraser, masks, etc. Unlike the above two apps Photoshop Mix and PicsArt, you can either start with a blank canvas or with an existing photo or picture to start editing. One of the best features of Multi-Layer Photo Editor is that it can import and save images directly from or to your local network over WiFi. Pricing: The base app is free, contains ads, and some features like selection masks, blend modes, and custom output resolution are behind the paywall. You can get rid of the ads and unlock premium features with an in-app purchase that costs you around $7. 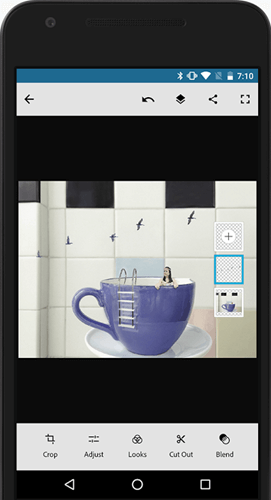 Byte Mobile’s Image Editor is yet another Android image editing software that supports photoshop like layers. What makes the app special is that it is very lightweight, straightforward, and easy to use. In fact, the app is very similar to Multi-Layer Photo Editor but is not as feature-rich. That being said, anything you add like photo frames, stickers, drawing, images, shapes, etc., are automatically added to a new layer. Just like the other apps, you can manipulate each and every individual layer with custom colors, blending options, opacity, material, drawing, lighting, etc. If you want to, you can choose the “Draw” option and start drawing. Of course, you can still create and use layers as and when needed in the Drawing mode. 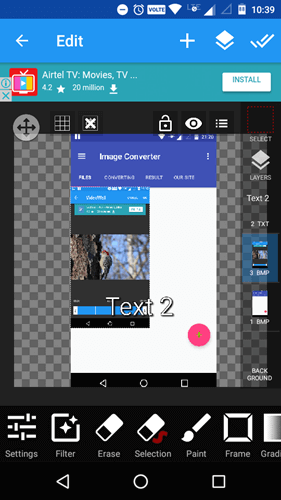 All in all, if you are looking for a lightweight image editing software that also supports layer then try Byte Mobile. Pricing: The app is completely free and contains ads. If you want to, you can remove the ads with an in-app purchase of $0.99. Of all the apps shared here, PhotoLayers is one of the simplest in terms of both features and user interface. The app is mainly aimed for users who want to create quick yet detailed photomontages i.e, create composite photography by overlapping, cutting, and gluing different photos into one. Being a simple app with a focused target audience, you won’t get all the tools you see in the above apps. However, PhotoLayers does have all the basic options like layers, color correction, shadows, flipping, resizing, rotating, cutting, masking, etc. The good thing about the app is that it gives you access to a simple yet detailed guide right on the home screen which shows what you can do with the app. 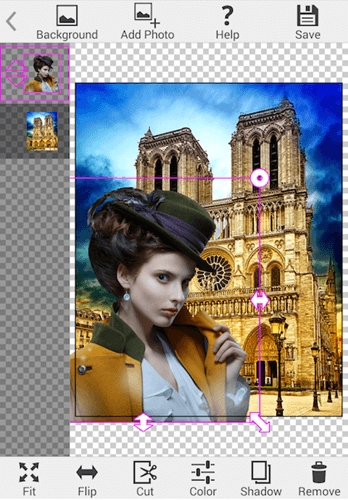 So, if you are into superimposing and photomontages then PhotoLayers one of the best apps for it. Give it a try. Pricing: The app is completely free and is supported by ads. Canva is very different from all the apps shared on this list. In that, it is not your traditional photo editing software and is mainly aimed at creating gorgeous designs, posters, blog banners, social media banners for facebook, twitter, Instagram, etc. 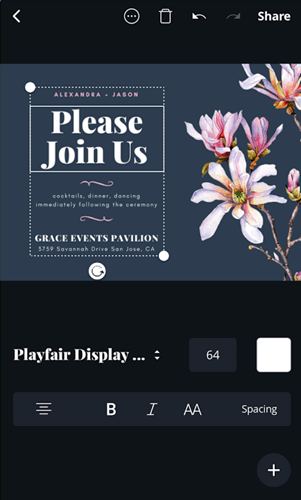 You can even design invitations, cards, and photo collages. What makes Canva special is its huge library of stock photos, support for typography and custom templates. Of course, it does support layers and you can manipulate them with basic tools like resizing, and flipping. Canva is not for everyone but if you are looking to create posters, banners, and cards then Canva is for you. Pricing: Canva is free but it also offers custom backgrounds, templates, etc., as in-app purchases. You can use the free ones or create your own if you don’t want to pay. That’s if for now. These were some of the Photoshop like image editor for Android that supports layers and transparency. My personal pick is PicsArt, due to huge community and video tutorial available on YouTube. Unfortunately, most layer based image editor does not support RAW images. So, for that you can use Adobe Photoshop Express or SnapSeed, the later one is more feature rich. 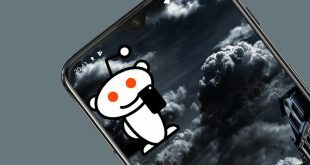 Comment below sharing your thoughts and experiences about using above Photoshop alternatives for Android.